The radar-scanning system will be introduced in two years on an all-new Volvo. Claiming it can cut rear-end crashes by as much as 50%, Volvo Car Corp. unveils its City Safety low-speed, collision-avoidance system in Gothenburg, Sweden. Volvo says City Safety is a unique passive system that differs from other optical-radar systems used in some European and Japanese luxury models. 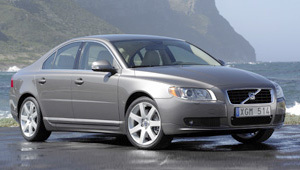 The ’07 Volvo S80 that debuts in February also has a collision-warning and braking system that works at all speeds but does not provide full automatic braking to prevent accidents. The driver must brake to augment the S80 system. The City Safety’s radar scanner is located in the upper part of the windshield, at the same height as the rear-view mirror. It can detect vehicles up to 20 ft. (6 m) on the road ahead. Volvo says City Safety likely will prevent collisions at speeds up to 19 mph (30 km/h), when the speed difference between the two vehicles is less than 9 mph (15 km/h). Under these parameters, the system is designed to focus on reducing speed as much as possible before an impact. The radar, which emits infrared light that can’t be seen by oncoming drivers, continuously scans traffic in front of the car. The system uses an algorithm to activate when a vehicle in front is stopped or moving in the same direction. Calculating the distance between a vehicle in front and the City Safety-equipped Volvo’s speed 50 times a second, the system determines the brake force necessary to prevent a collision. When the force exceeds a given level without the driver initiating braking, the City Safety system determines a collision is imminent and automatically pre-charges the brakes and releases the throttle. Ingrid Skogsmo, director of Volvo Cars Safety Center, says City Safety also can sense a collision is imminent if it detects a vehicle in front braking suddenly. Pre-charging the brakes helps the driver stop the car more quickly. If that doesn’t happen, or if the driver fails to steer around an obstacle, City Safety automatically fully activates the brakes via a hydraulic pump. Skogsmo says Volvo’s avoidance system benefits other drivers, as well. “The system can help reduce or sometimes even eliminate the cost of repairs to both vehicles,” she says, adding it also reduces whiplash in rear-end collisions. Volvo engineers decided not to keep the pre-charging continuously activated, as doing so could wear the brakes prematurely and reduce fuel economy. “It is important to emphasize that the system does not absolve the driver from driving with adequate safety margins in order to avoid collisions,” Skogsmo says. Volvo says City Safety’s sensor is limited by fog, mist, snow or heavy rain, as are other radar systems. Drivers will be urged to keep the windshield free of dirt, ice and snow. An alert is activated on the instrument panel if the radar is blocked and reminds the driver to clean the windshield. Volvo engineers say City Safety could, in some cases, prevent hitting pedestrians but cannot guarantee the present system will do that in all situations. However, the pedestrian-friendly feature could become a reality in the future, they say. City Safety also is not designed to prevent accidents with oncoming vehicles. The Swedish auto maker has yet to decide if City Safety will be standard equipment or an option. It also declines to estimate the system’s cost. Volvo says it plans to offer the City Safety system in all of its markets, except where legislation makes it prohibitive. A spokesman says other Ford Motor Co. brands can use the system, as well.